The walk on this date was to have been to the Stone Columns in the Middle Creek Valley, but that walk was deferred to the Spring due to access issues with the dirt/gravel road. 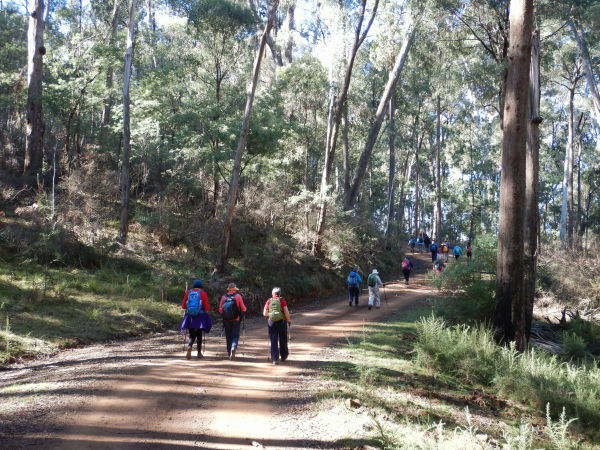 However, Jeanette quickly produced this alternative venue, an 18km walk through forested areas to the east of Beechworth, heading for the historic Wallaby Mine. And what a day it was, glorious sunshine, lots of tall timber, with some autumn colours from the non-native trees, and a crew of 21 that included new members and visitors. 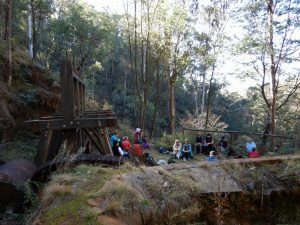 We set off from Lake Sambell at about 10am, and took it slowly through to the Wallaby Mine, taking time to check out the left-overs from the gold mining era, and arriving at 1pm for lunch at the Gold Mining Battery. This is an abandoned 12-head stamping battery, and there are other relics nearby, including the remains of a horizontal steam engine and other machinery. The actual mine (which we also visited) is upslope from the Battery, and dates from the peak of the gold mining era (1860s) whereas the Battery we saw today dates from 1912 (the original installation was destroyed by bushfire). The return to Beechworth was via the outgoing route, and we had another opportunity to enjoy all the features of this interesting venue. Some walkers returned to Beechworth by car (we had previously dropped off two cars at the car park about a kilometre from the Mine) and so had a 10km outing, but for the rest of us it was a full 18km walk (18.48km according to our GPS). Afternoon tea was enjoyed back at Lake Sambell, a busy place, with many day visitors to the area. Many Thanks to Jeanette and Michael for their slick organisation (including a map, and track notes) at short notice.